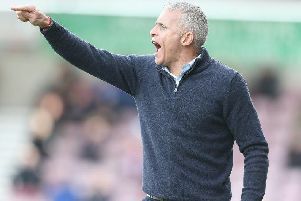 There’s always somebody worse off than yourself… and if you are a long-suffering Cobblers fan frustrated at your side’s sluggish start to the season, then look no further than Notts County. The oldest professional club in the world reached the play-off semi-finals last season, before going out to Coventry City, who would go on to win promotion at Wembley. Kevin Nolan seemed to have something going, and was handed plenty of cash over the summer to strengthen a squad that was strongly tipped to be one of the frontrunners this season. A total of 12 new players were signed either on permanent deals or on loan, with substantial fees paid out for the likes of Kristian Dennis from Chesterfield and Enzio Boldewijn from Crawley Town, but the expectation has weighed heavily on shoulders at Meadow Lane. The Magpies have failed to win any of their opening 10 games to the season, and mustered just two points to sit bottom of Sky Bet League Two, already anxiously staring over their shoulders and the unthinkable drop into the non-League abyss. Nolan survived just six games of the new campaign before he was shown the door, with Harry Kewell being head-hunted from Crawley to take over. The Australian has endured something of a baptism of fire, losing his first game in charge 5-1 at Exeter City, and then drawing 3-3 at home to Stevenage in a game that County led on three occasions. Those two matches continued an alarming run of league games for the Magpies, that have seen them concede at least three goals seven times in succession! Indeed, the only time County haven’t conceded three goals in the league was on the opening day of the season, when they drew 0-0 at home with Colchester United. So, on the face of it, the Cobblers couldn’t be facing a better team this Saturday as they look to bring an end to a mini slump that has seen them lose their past two league matches. The Cobblers have struggled all season to convert chances into goals, but with County’s defensive record there for all to see, Town surely have to be confident going into this one. “Well it should be a good game,” said boss Dean Austin when asked about County’s current problems with keeping the ball out of their own net. “Seeing that they have conceded quite a few goals does give us some optimism. “But as for our players, when you are not getting the results it does dent confidence, because when you’re not winning that’s what happens. “I believe the boys know they can win games of football, and we are in a determined mood to put ourselves on the road to recovery on Saturday and get some points on the board. The Cobblers will be without the injured Junior Morias and Daniel Powell, while Aaron Pierre is suspended.